The King of Pentacles represents consistency, faithfulness and above all a vision about the future. He is the good news especially for singles because he implies a long term satisfying relationship. Yes, getting upright King of Pentacles in a love reading means that a man will soon appear in a girl’s life. Moreover, this man will be there in her life for a long period of time or forever. Apparently, this king is the epitome of great commitment that every woman wants from her man. For feelings, King of Pentacles represents true love which does not die easily. At the same time, it tells that the love interest is not going to go out of your life anytime soon. It is also possible for him to just approach you with a message that he wants you as his girlfriend. From my newest readings, I have discovered some unusual personality traits in this man. He truly is a wise lover. Take a look at the coin in his hand. This object clarifies that no matter how loyal he is in a relationship, he does have the mind of a businessman. What this means is that not just any girl can win his affection. He believes in equal level of give and take. He will not commit to someone who is rude or sees love like a game. In short, he does not fall for the bad apples. He would rather wait for that special someone for years than letting his heart break into pieces by a random girl. 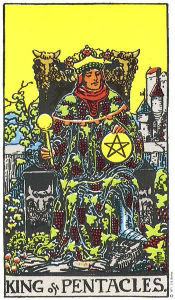 Reversed King of Pentacles says the opposite. It basically implies that there might be some double dealing in the relationship. In reversed position, this king cannot be trusted because he can have the tendency to use his dear ones for personal gains. Also he might have trouble feeling the love that he gets from his girlfriend.